Native American Jewelry from the American Southwest is not only an american heritage, it is a world treasure. Native American Indian Jewelry began in 1865 and the American Indian Artisans of Southwestern USA have been prolific in designing innovative, one of a kind, original works of art since. Native American Jewelry from the Southwest is unique from all other Silver Jewelry produced elsewhere on earth, it has real value, is collectible and quality Native American Jewelry is a great investment! Native American Jewelry with Turquoise has been a standard in Southwestern USA for generations among Native Americans as well as the Native American Indian Jewelry industry, nearly since its beginning in the early years. Native American Turquoise Jewelry today is in a field of its own and recognized by serious Jewelry collectors from around the world. Durango Silver Company strives hard to offer you trusted authentic quality Native American Jewelry with the highest quality authentic and natural high grade Turquoise. In today's world market rich with trade from countries around the world who produce wonderful goods as well as immitation goods, it is continuously getting harder to find quality Turquoise Jewelry, especially Native American Jewelry. Above and to the left is a beautiful piece of Native American Jewelry, a Navajo Cluster Row Bracelet handmade by Navajo Artisan Patrick Yazzie. This beautiful piece of Navajo Silver Jewelry has over 60 Sleeping Beauty Turquoise stones set in a beautiful classic Navajo design. 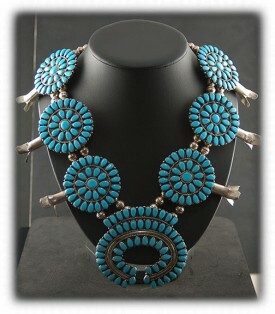 This a great example of high end handmade Native American Jewelry. To the right is a beautiful Zuni Indian handmade Squash Blossom Necklace made with Sleeping Beauty Turquoise in Sterling Silver. This is a classic Native American Indian Jewelry style that has been produced for over 100 years and is still a marvel today. This type of Native American Silver Jewelry is genuine to the American Indians and is not inspired by any other culture. 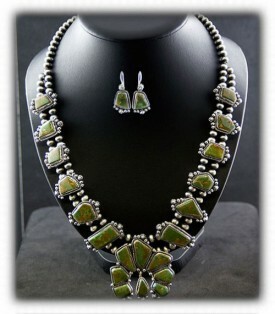 So if you are looking for a true piece American Indian Jewelry, this would be a great style. To the left is a beautiful Carico Lake Turquoise Ring and a great piece of Native American Turquoise Jewelry. Carico Lake Turquoise is one of the most popular and beautiful types of Turquoise being used in Native American Jewelry today. 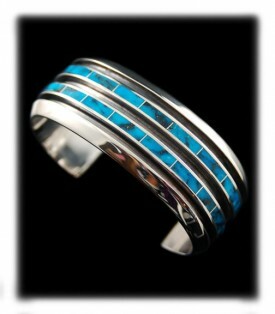 This is a classic modern style piece of Navajo Silver Jewelry. This is a great example of the handmade silver rings being made in the Southwest today. To the right is an outstanding Zuni Inlay Turquoise Bracelet handmade by Larry Loretto. Larry is an great Native American Artisan that make one great piece of Native American Jewelry after another. We recommend buying and collecting the work of Larry Loretto, you can be certain you will find Larry's fine pieces on our site in the future. 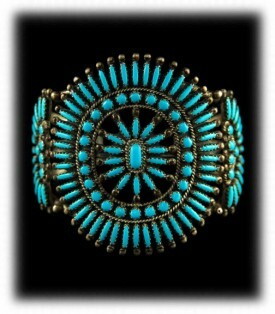 Check out the presentation page for this beautiful Zuni Inlay Turquoise Bracelet. 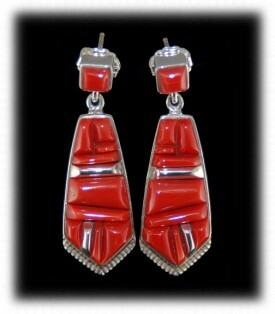 To the left is a fantastic pair of inlaid Coral, Native American handmade earrings. The gemstones are individually hand cut and set into the handcrafted Sterling Silver channels. 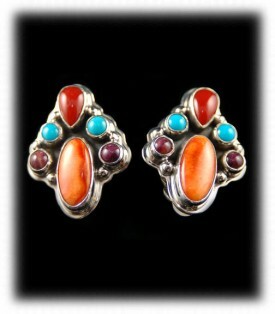 Durango Silver Company always has outstanding Native American Jewelry for you to choose from. To the right is a pair of multi-colored Navajo Cluster Earrings. Navajo Artisans make a wide variety of gemstone Earrings and their multi-stone cluster work is one of their most popular styles in Sterling Silver Earrings. Durango Silver Company has been in the Native American Jewelry business for nearly 40 years dealing in high quality unique pieces of American art. You can count on our company for authentic Native American Jewelry and Native American Indian Jewelry of unquestionable quality. 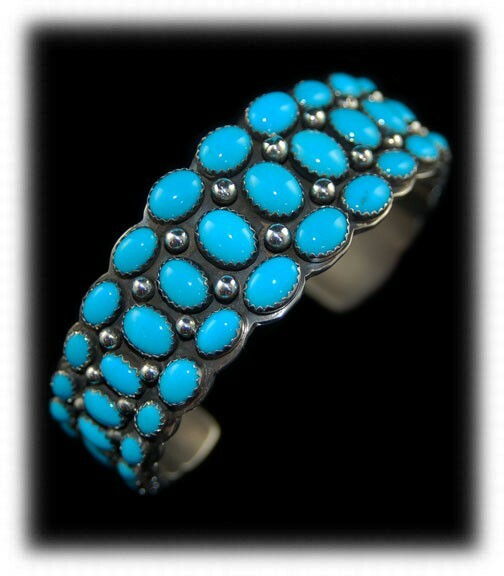 You can also count on us for having some of the worlds finest authentic Turquoise in our Jewelry - Guaranteed! 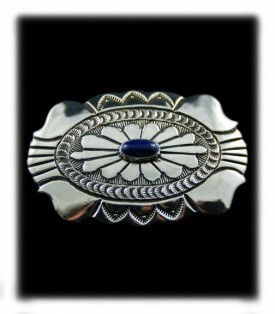 To the left is a classic Navajo Sterling Silver Buckle with a Lapis gemstone. This is very attractive belt buckle that either a man or woman can wear and be proud of. Native American Jewelry is a great Jewelry choice, it is handmade in the USA and truely artistic! To the right is a Zuni Needlepoint Cluster Turquoise Bracelet, this type of Zuni Bracelet has been made for nearly 100 years and they are still as popular as ever. The Zuni craftsmen make Rings, Pendants, Necklaces, Earrings and more in the Needlepoint design. Durango Silver Company usually has a good stock of Zuni Needlepoint Silver Jewelry. This is a really unique and genuine Native American Turquoise Jewelry design unique to the American Indians and not inspired by any other culture. We hope you have enjoyed our presentation on Native American Jewelry and have gained some useful knowledge from it. We invite you to learn more about Native American Jewelry and Native American Turquoise Jewelry by following the links in our Learning Center to other informational pages that we have written on different topics related to Native American Silver Jewelry. In addition, we would like to invite you to join our E-Mail Newsletter - about once every other month we send out a Newsletter to inform our members of what's happening with Durango Silver Company, new products, specials for our members and more. We also have a monthly drawing from our member base to give away free Turquoise Jewelry from our company. Please take a moment to become one of our friends by signing in below. We hope you will consider Durango Silver Company the next time you are thinking of Native American Jewelry.